Last summer, I taught a Social Media Law course in Northern Italy. In that class, we followed the Amanda Knox case from an open minded international perspective, and how social media tools shaped public opinion, both in the U.S. and abroad. 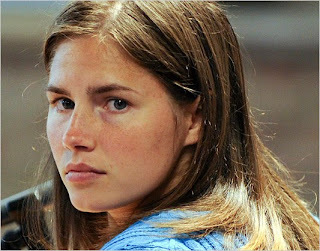 Italy's Court System - The Amanda Knox case started in the Court of Assize (2 Judges and 6 jurors). The presiding Judge must be a member of a Court of Appeals; beside him/her sits a lay judge. Decisions are made by the giudici togati (Judges) and giudici popolari (Jurors) together at a special meeting behind closed doors, named Camera di Consiglio, and the Corte d'Assise is required to publish written explanations of its decisions. The lay Judges are paid for every day of actual exercise of their duty; and, in these instances, are considered public officials. They continue in office for two years. Lay Judges wear a sash in the national colours and are not technically jurors, as the term is understood in Anglo-Saxon jurisprudence. In Italian, Giudice (Judge) refers both to the eight of them together as a collective body and to each of them considered separately as a member of that body. Since lay Judges are not jurors, they cannot be excused, unless there are grounds that would justify an objection to a Judge. Also, they are not sequestered. Amanda Knox appealed her conviction to the Appeals Court of Assize (2 new judges and 6 new jurors) – Same composition of judges and lay judges as the Corte d'Assise, but the Giudici Togati are senior to the judges of the first court. The Corte d'Assise d'Appello must also publish written explanations of its decisions. This appeal includes a complete review of the evidence – in effect a retrial. Harry - you cut and paste the same misinformation everywhere on the web. You are like a rash that won't go away. Your posts are discredited by the evidence. Go to www dot injusticeinperugia dot org for a full exposition of this miscarriage of justice. The Perugian justice system is out of control on this one. it is an international scandal. Thanks For Providing grt information about Social Media Law site.